The following is an excerpt from an article by V. Hill which you can read in its entirety at www.KartPartsDepot.com in the Depot Depository. From the very beginning, karters seemed to focus more of their attention on the go portion rather than on the stopping portion of kart racing. Brakes have seemed to take a back seat to the power plants and chassis in the search for speed. With the advent of the very large penetration of European karts, mainly Italian made karts, the number of brake choices for the karter is even larger. Every brand of kart seems to have their own take on brakes and the parts are not interchangeable from one brand to another. 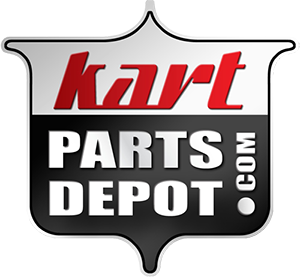 For the karter, this means that he or she may need to keep more parts in their own selection to support if they have more than one brand of kart they use in their racing arsenal. The science of brake design and developing brake technology is more about the materials used in the manufacturing of the brake rather than any new or fundamental changes in the mechanics of the brakes. The basic design parameters are pretty much set for the karter. The disc is one component you can tune to tailor the brake system to suit your individual needs. Karters have made discs out of everything from Detroit wonder metal, Cast Iron, Steel plate, Aluminum and even exotic metals like Titanium and Beryllium. But the material of choice seems to always gravitate back to Cast Iron. Nothing seems to be able to beat this material for it ability to under go many heat cycles without distorting. It is relatively inexpensive and it has great wear capabilities. Carbon-Carbon was even tried for a short time. It offered great performance and it was incredibly light - often the disc would weigh less than the nuts and bolts used to hold the disc to the hub. But it was very expensive; really expensive, a single disc could cost $200.00 to $500.00 dollars depending on the application. The Carbon-Carbon disc also required special Carbon-Carbon brake pads so the cost was really astronomic. But no matter how much things change, they still seem to be the same. Cast Iron is the material of choice and that holds true in 90% of the racing series around the world, not just karts.